Gifted, passionate, innovative, fearless - these are just some of the words that come to mind when I think of Executive Chef Michael O'Dowd. I've been a fan ever since experiencing his unique “Native American with global accents” philosophy via the menus he introduced when he opened Kai in 2002 at the Sheraton Wild Horse Pass in Chandler, Arizona’s only five-star, five-diamond restaurant. You'll even find his cookbook collaboration, New Native American Cuisine: Five-Star Recipes From The Chefs Of Arizona's Kai Restaurant, on my book shelf. Since leaving Kai in 2012, he has continued to to forge his path and follow his adventure, including stints at Sheraton Grand Phoenix and operating his own restaurant group, before arriving in Sedona. As Executive Chef of L'Auberge de Sedona (find out more about this gorgeous creekside resort here), he brings his creativity and prowess to this luxury property's on-site restaurants, Etch Kitchen & Bar and Cress on Oak Creek. Needless to say, when I received an invitation to explore Chef O'Dowd's dishes on a media trip to L'Auberge, I didn't hesitate to say yes. Cress on Oak Creek's idyllic creekside setting has earned L'Auberge recognition as one of the "Top Ten Restaurants in the Southwest” by Condé Nast Traveler and one of the “Top 100 Al Fresco Dining” spots in the U.S. by OpenTable. Open daily at 5 pm, guests can choose three- or four-course dinners with optional wine pairings, but to fully experience Chef O'Dowd's culinary magic, I suggest ordering the Chef's Tasting Menu, expertly paired with wines by Sommelier Michael. We started with Craggy Range Te Muna Vineyard New Zealand Sauvignon Blanc. Its fruit and acidity was a perfect partner to a wonderful sweet pea, edamame, and creek cress soup poured around a mound of fresh crabmeat, lobster and corn, and embellished with dehydrated tomato dust and micro greens. A golden pour of Cru Barréjats Sauternes heralded our foie gras course. 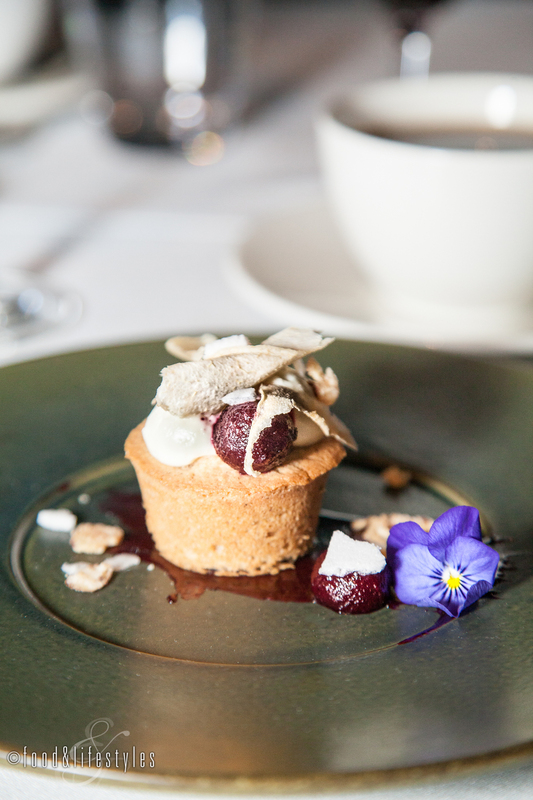 And wow, what a decadent course this was - delivering seared foie gras on buttery brioche with lingonberry jam on a whimsical swathe of toasted marshmallow fluff, with foie gras powder, black truffles, and candied cippolini onions. 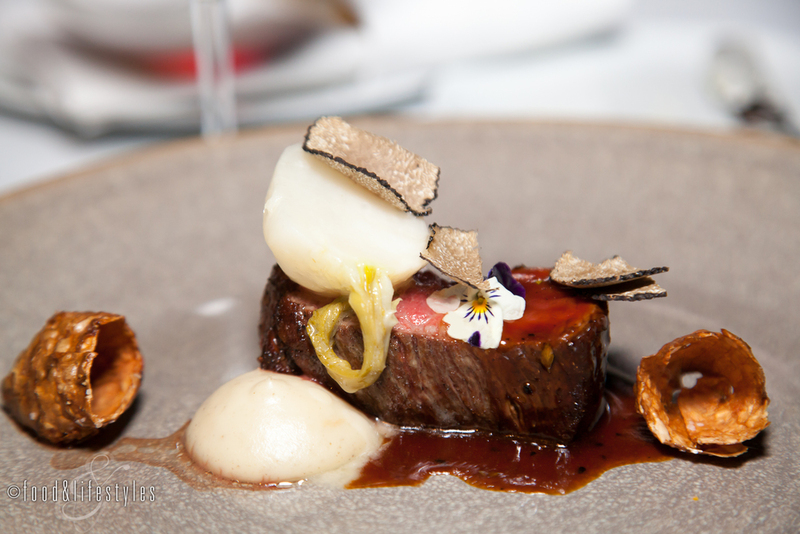 It was a a perfect representation of Chef O'Dowd's creativity and another stunning plate. Next was an equally fabulous melange of textures and tastes - a bright and fresh salad starring sweet and juicy canteloupe, yellow watermelon, sliced apples and grapes, strewn with citrus ice, and accompanied by a dragonfruit cube topped with balsamic pearls. My favorite Chef O'Dowd touch? Slices of sweet and smoky lap chong (Chinese sausage), tying everything together into a perfect harmonious medley. This was paired with an aromatic Domaine de Triennes Sainte Fleur Viognier and its underlying notes of melon and lemon zest. "This might give you a clue that next is something Italian," said Michael as he poured a Vajra Barbera d'Alba Superiore from Piedmont, Italy. Chef O'Dowd's open-faced lasagna was another delicious winner. A silky ribbon of pasta was slathered with a rich and intensely-flavored tomato sauce and piled high with orbs of milky housemade mozzarella, locally-grown root vegetables, asparagus, colorful cauliflower florets, umami-laden black garlic, and fresh sprouts, creating another mouthwatering combination. I'm a seafood lover and our next course sang of the sea. Paired with a Spanish Burgans Albarino, seafood ceviche delivered pure and pristine bites of steelhead, scallop, and amberjack. Chef O'Dowd's elevated accents included a bed of thinly-sliced iced smoked trout, pickled chard, green algae powder, banana, and avocado mousse in a citrus "broth." 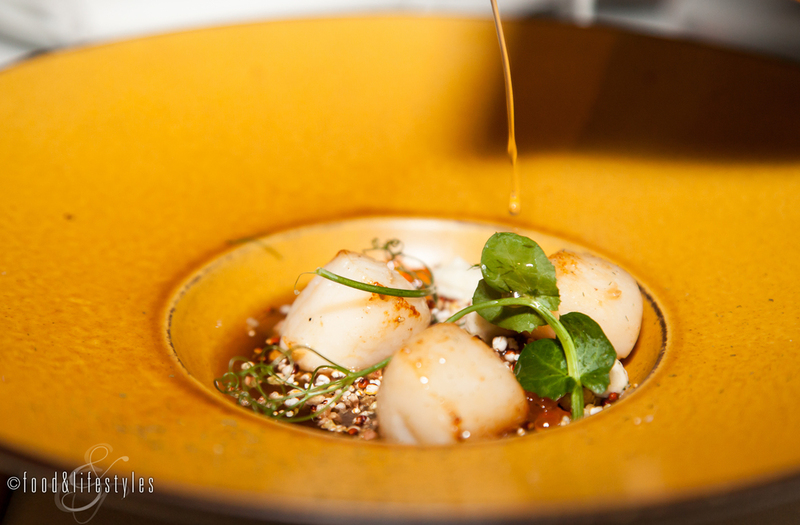 Bananas and seafood might be reminiscent of casual beachside huts in the tropics, but in Chef O'Dowd's hands they once again exemplified his sophisticated and innovative palate. A stellar Bordeaux and venison pairing was the main course for our al fresco repast. We sipped on Chateau Lassegue Les Cadrans de Lassegue Grand Cru as we relished a juicy steak of mole spice-rubbed venison with creamy Peruvian purple potato puree, locally-harvested vegetables and a rich juniper-scented demi-glace. 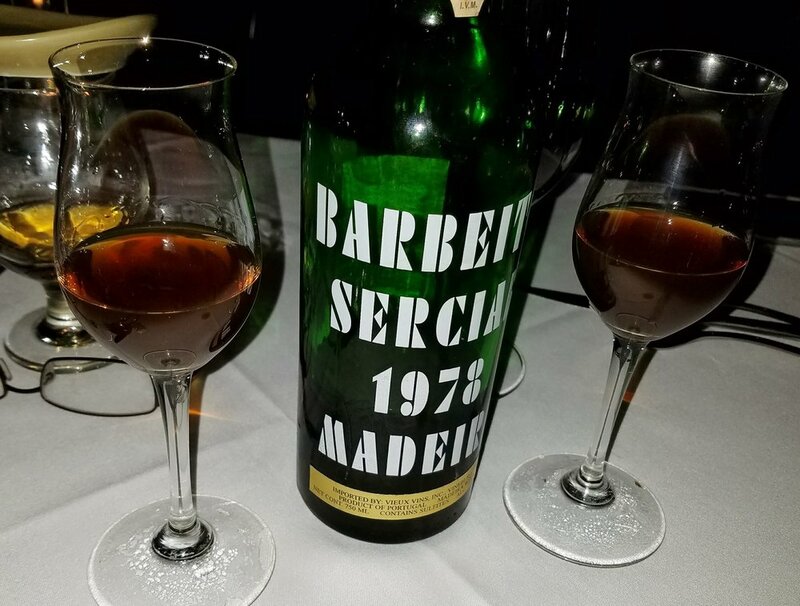 A fitting end was indulging in a dessert of gold leaf-gilded chocolate pyramids with 1978 Barbeito Sercial, a dry madeira with a warm finish of figs and hazelnuts. A picturesque setting paralleled by an exclusive dining experience - Cress on Oak Creek with Executive Chef Michael O'Dowd is a culinary treat not to be missed. Campari and Imbibe Magazine have once again joined forces for the fourth annual Negroni Week, which takes place on Monday, June 6th through Sunday, June 12th. Participating venues will donate a portion of the cost of featured Negronis to a charity of their choice. If you're a fan of bold, spirit-forward libations, it's time to try a Negroni, and what better setting to enjoy this ruby-hued cocktail than surrounded by the soaring magnificence of Red Rock Country? A combination of London dry gin, vermouth rosso, and Campari delivers a polarizing cocktail with a harmonious balance of sweet and bitter. Here you'll find five variations of this Italian aperitivo, ranging from classic to creative. Relaxing at Enchantment Resort with its prime location nestled within Boynton Canyon ensures you'll be surrounded by majestic views as you sip and savor. Order a classic Negroni from bartender Sean Augard and you'll be treated to an elegant rendition served up with the traditional elements of a clean London-style dry gin, Campari, and sweet vermouth. A second feature will be the Enchantment Negroni, a refreshing variation embellished with grapefruit sorbet and garnished with grapefruit peel. The charity they've chosen to support is the Sedona Community Food Bank. Another favorite spot - Amara Resort - boasts the talent of Ardi Dulaku at SaltRock Kitchen (see prior interview here). His inventive SaltRock Negroni is made with smoky Vida mezcal, Beefeater 24 with its notes of green tea and lemon peel, cream sherry instead of vermouth to add a mellow sweetness, and Campari. Stirred and served over ice, it's finished with a garnish of grilled lemon. I can't think of a better way to cool down on a warm Arizona day than with Ardi's Blended Negroni. This clever frozen concoction of exclusive Kimpton-strength Aviation gin, Campari, and Lillet Rouge, a fortified wine, is smoothly blended and crowned with a bruléed orange slice. SaltRock Kitchen will be donating a portion of the cost of both their featured Negronis to the Arizona Humane Society. Leave the spectacular vistas of sandstone cliffs and ensconse yourself in the lush beauty of L'Auberge de Sedona on the banks of Oak Creek to enjoy a Negroni No. 9. Here at Etch, head bartender Alex Sunseri rotates the components in his nine-ingredient Negroni to experiment with unique flavor combinations. His most recent batch includes three white vermouths, three amari, and three gins - a saffron gin and two locally-distilled Arizona gins. Look for a barrel-aged Negroni to debut soon. "I enjoy the alchemy of cocktail mixing and the effect of wood on flavors is profound," notes Alex. In the works is a Negroni No.9 flight which will include five different batches of No.9 and a sample of Alex' oak-aged version. While a Negroni is a favorite to order anywhere I spy a bottle of Campari on the back bar, it's especially fitting to enjoy this cocktail (allegedly invented in Florence) at an Italian restaurant. At Chef Lisa Dahl's Pisa Lisa, order a Negroni made with Bullldog gin, Cinzano's special-edition 1757 vermouth, and Campari garnished with an orange slice and lemon twist. I suggest following it with my favorite wood-fired pizza in Sedona (try the Primo Portobello with sausage or the Funghi with gorgonzola and caramelized onions) and ending with a scoop of flavorful gelato. For Part I of our stay at picturesque L'Auberge de Sedona, visit this link. 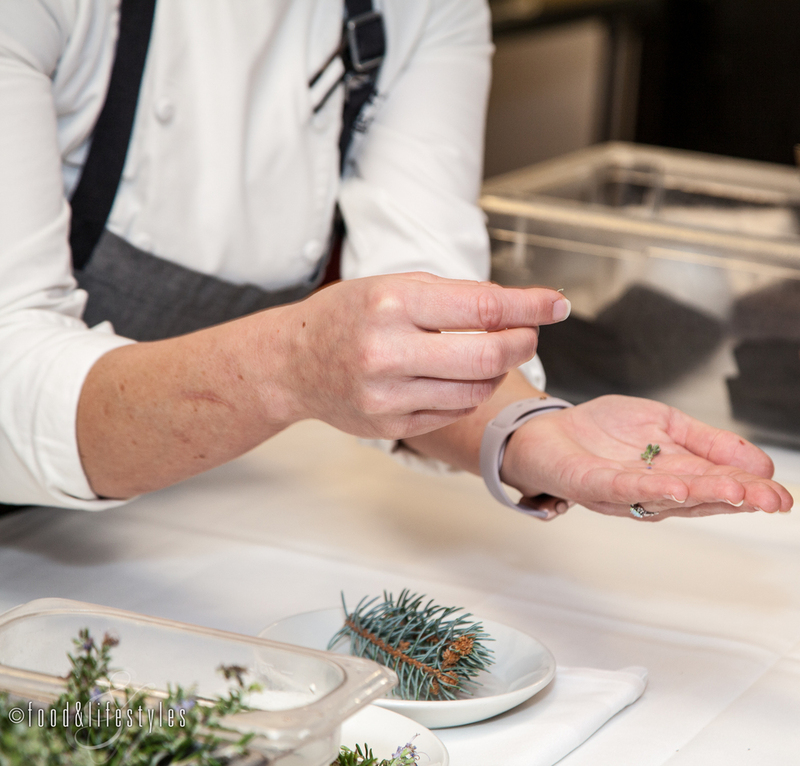 Our evening on Day Two (see our afternoon here) continued with a glimpse into the recently renovated state-of-the-art kitchen of Cress on Oak Creek as Executive Chef Rochelle Daniel led us in a lesson on foraging. Chef Daniel's seasonally-driven menu includes ingredients harvested on site and we learned that the prime foraging seasons are spring and fall. 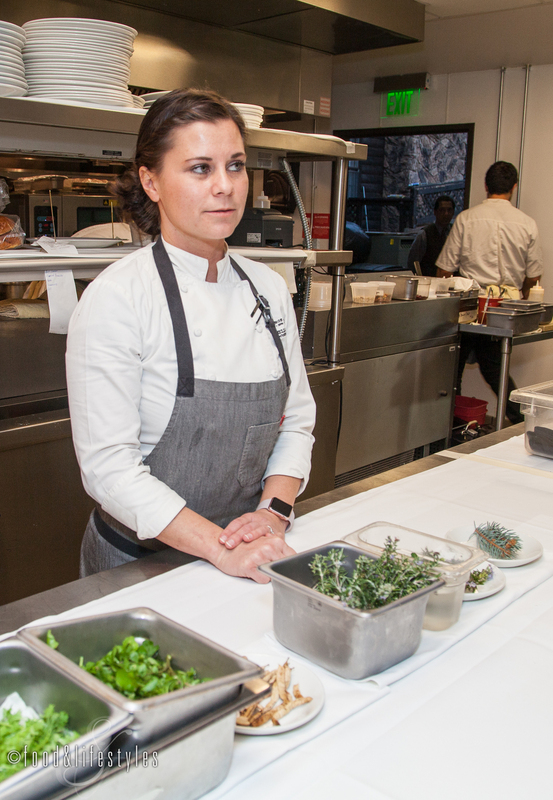 The inspiration found in incorporating local ingredients is an important part of her cooking philosophy. Creek cress ("especially good with fish dishes"), rosemary, wood sorrel, juniper berries, spruce pine ("used to infuse tinctures, vinegar, and honey"), mushrooms, blackberries, strawberries, and mesquite pods ("toasted and ground to make crackers and bread") all find their way into her dishes. Our fascinating culinary session was followed by a cocktail class led by General Manager Salim El Khayati. Key components were vodka infused with rosemary and muddled blackberries, both found on the property. 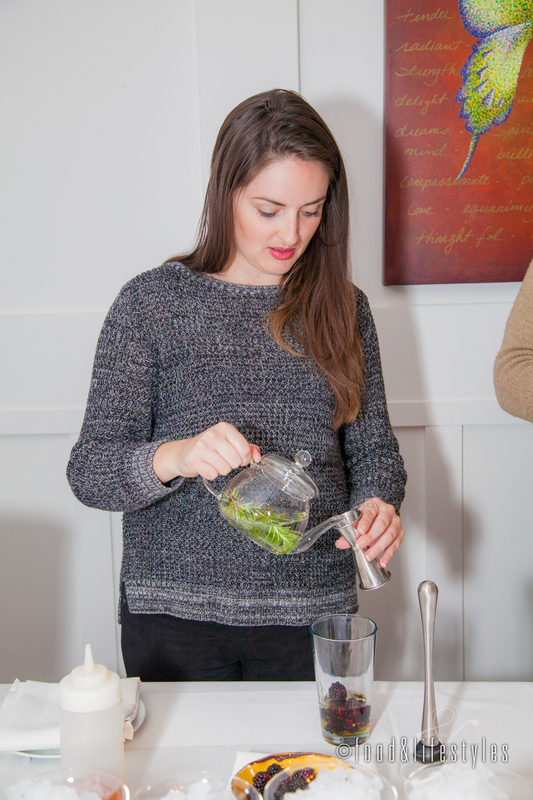 Our hands-on class had us measuring and mixing the rest of the ingredients - Chambord, Grand Marnier, and sparkling rosé - which resulted in a refreshing, vibrantly-hued crowd-pleaser. Our convivial group mingled and sipped before being led to our creekside tables under starry skies. How to end a magical stay at L'Auberge de Sedona? With an outstanding tasting menu showcasing Chef Daniel's deft skill at weaving sophisticated techniques with creative flourishes and ingredients reflecting the unique Sedona setting. 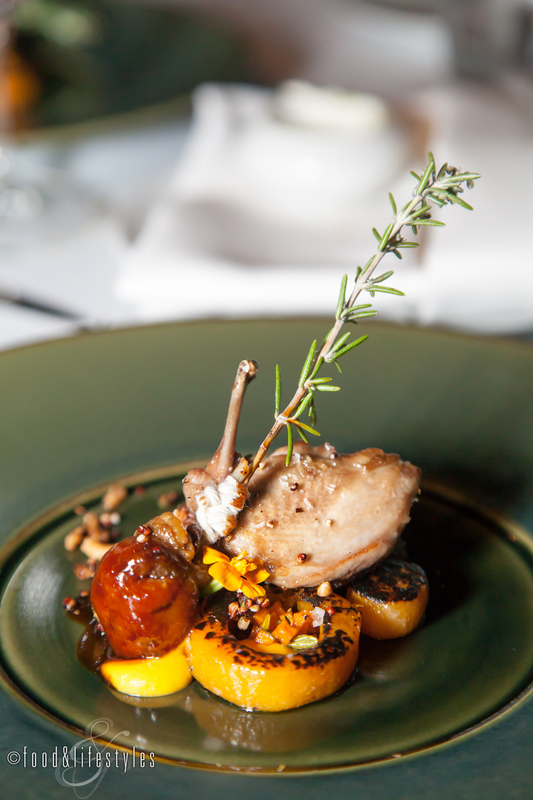 Quail with butternut squash and pickled cranberries. Looking for an unparalleled experience in the heart of Sedona? Look no further than L'Auberge de Sedona on Oak Creek.